People aren't "obese". People have obesity. That distinction is referred to as people first language and many have championed its use and importance in other chronic diseases and especially in regard to mental illness. Not using people first language labels the individual by way of their medical condition, and when it comes to "obesity", given the incredibly negative societal stereotypes associated with the word, labeling an individual as "being" obese carries with it real stigma. 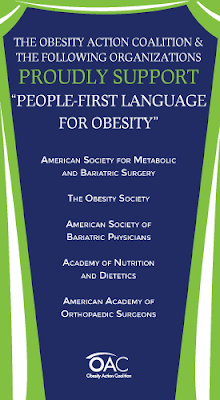 The Obesity Society and the American Society of Bariatric and Metabolic Surgery have both formally adopted people first language but 3 days into their joint Obesity Week conference, and more than a dozen speakers later, I have yet to hear it used once in a lecture hall here. And given the speakers who clearly in many cases aren't using people first language are the very experts called upon by the media for comment on obesity, their adoption of people first language is important beyond these lecture halls. Here's hoping that next year both TOS and the ASMBS provide their speakers with more aggressive encouragement as to the need for and value of people first language with obesity. Perhaps a category on people first language on the speaker evaluation could help as many no doubt see the value, but might not realize they aren't adopting it.